For the longest time this Eve / Warhammer blog was read by me and the guys of my warhammer gaming group when I linked here from the forums. Basically, the Eve posts were pretty much me yammering to myself. 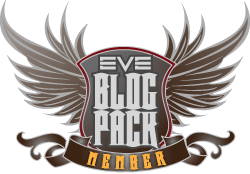 Well recently I've been adding Eve blogs to my reading list and came across The Ancient Gaming Noob, a well written blog about MMO gaming and such. Since he is a new player to Eve I've been posting suggestions to help him in his comments and in the process unintentionally advertising this place. So I figured a welcome post was due and I hope I can provide enough interesting posts to get some regular readers. Introductions are in order to my Eve characters. 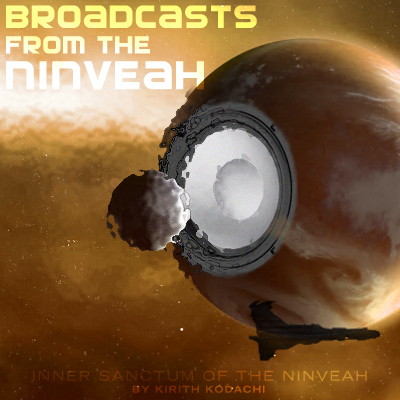 I consider my main to be Kirith Kodachi who I created when I first joined the Eve universe and had no clue about anything. 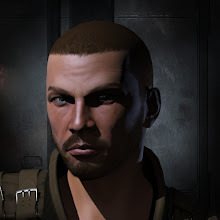 I started in Sept '06 with 5K skill points and joined a group of known friends in their corp out in Placid where I cut my teeth on mission running, PvP, and 0.0 life in Syndicate. I originally started down the missile route (and the Caracal is still one of my favourite cruisers) but decided to be different when news of the Rokh started to come out and have been training gunnery skills along with other combat stuff ever since. Well, not completely true: I did spend a couple week training Trade skills for a while when I considered becoming a full-time trader but my bloodlust was too much. Right now Kirith can fly all T1 Caldari and T1 Gallente up to Battlecruisers, and for T2 ships I can fly all the Caldari frigates. I'm currently training up for T2 rails. My alternate character I started on a second account soon after I started is called Derranna Elkadar and she was designed at first for doing manufacturing. Then I got her into blueprint research. Then she trained up for ice refining, which started me towards Invulnerability Field module invention, which lead towards cloaking device invention, and now ship invention starting up in a couple weeks. She also trained up for some mining in a retriever and T2 minmatar transports. If it has to do with industry, she'll be training for it sooner or later. - Korannon who is CEO of my original industrial corp (Kodachi Enterprises) and has some hauling skills and trade skills. I use him to buy and sell stuff that the industrial division needs or makes. - Joeseph Darvony who is CEO of the corp I purchased called Razor Technologies with faction standings to set up a high sec POS. - and Sun Tomah, a research assistant capable of doing Time Efficiency research and copying so Derranna doesn't use up all her available skills on T1 BPOs at the POS.